Britt Tres Rios Costa Rica Coffee I 12oz. 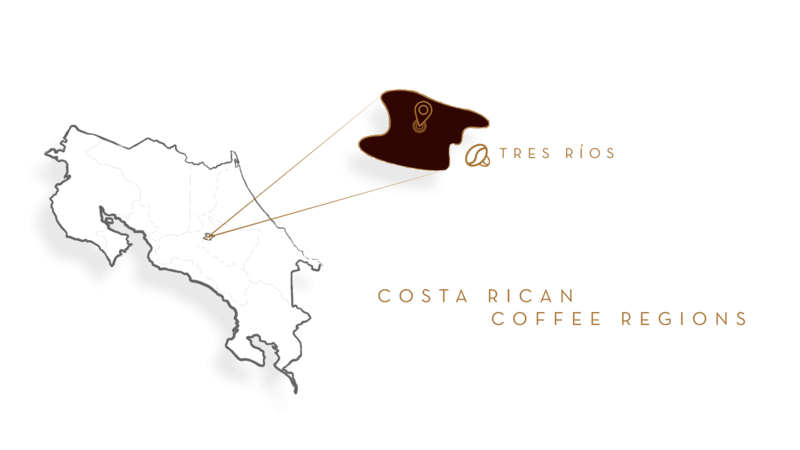 The Tres Rios coffee growing region is known as the "Bordeaux" of Costa Rica because of its reputation for producing some of the finest coffee in the world. The high-mountain climate, marked wet and dry seasons, and soils enriched by the nearby Irazu Volcano provide optimum natural conditions for growing fine coffee. Though it's the smallest coffee growing region in Costa Rica, its beans are some of the most sought after in the world. Described as one of our more "elegant" blends by our master cupper, Doña Carmen, this medium roast presents an aroma of honey-nut as well as flavors of plum, allspice, and orange citrus. Its brighter and well-balanced cup qualities make it ideal for enjoying mid-morning, or during a relaxing afternoon. The Tres Rios coffee growing region is known as the "Bordeaux" of Costa Rica because of its reputation for producing some of the finest coffee in the world. The high-mountain climate, marked wet and dry seasons, and soils enriched by the nearby Irazu Volcano provide optimum natural conditions for growing fine coffee. Though it's the smallest coffee growing region in Costa Rica, its beans are some of the most sought after in the world. Described as one of our more "elegant" blends by our master cupper, Doña Carmen, this medium roast presents an aroma of honey-nut as well as flavors of plum, allspice, and orange citrus. Its brighter and well-balanced cup qualities make it ideal for enjoying mid-morning, or during a relaxing afternoon. Full of flavor, this is the decaf of your dreams. Our house blend decaf is a mix of the harder, acidic beans of the Central Valley and dense, full-bodied beans of the Western Valley. After purchasing the beans for this blend from local growers in Costa Rica, we transport them to Veracruz, Mexico, where they are decaffeinated via the indirect water method. The beans are first infused with water vapor and then washed a second time with the same water to restore flavor that may have been lost during the first washing. This method retains as much of the flavor as possible, while eliminating 99.9% of the caffeine. Once decaffeinated, the beans are returned to Costa Rica where we carefully roast them to bring out their optimum flavors. Despite the dark roast required to coax the flavors out of decaffeinated beans, this blend is mild, with a light acidity. Its flavor is balanced and complex, with a unique aroma of seeds and dry leaves complemented by flavor notes of honey and clove. !--Some people would argue that decaf coffee isn't even really coffee, however, we think you'll beg to differ after trying our decaf. This coffee is a special "Mezcla de la Casa" or "House Blend", which is a mix of the harder, acidic beans of the Central Valley and dense, full-bodied beans of the Western Valley, which make the perfect combination of beans for a decaf. After purchasing the beans for this blend from local growers, we transport them to Veracruz, Mexico where they undergo the "indirect water method" decaffeination process that eliminates 99.9% of the caffeine without compromising on flavor. The beans are first 'washed' by infusing them with water vapor, and then washed a second time with the same water to restore any flavor that may have been 'lost' during the first washing. In this way, we are retaining as much of the flavor as possible, something you may not find in other decaf coffees.